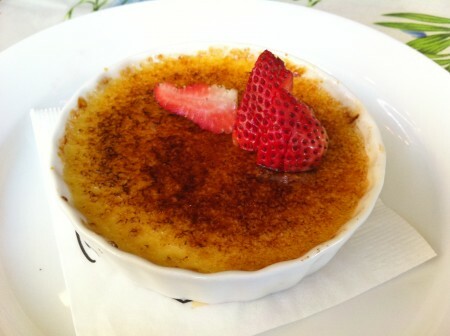 Creme Brulee | Dessert Darling from the Farmer’s Market. I was excited to try the original and banana flans that she brought to book club since they sounded legendary. Perhaps my expectations were too high though, because I didn’t quite understand the big to-do. Sure the flan was fine, but not necessarily greater than any other flan I’ve tried before. Woo Woo! 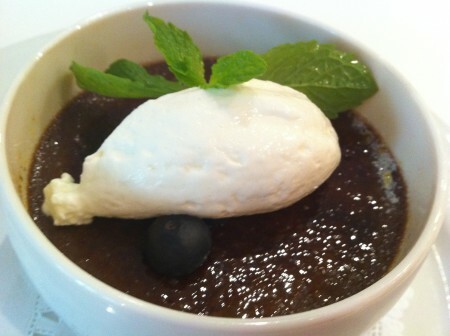 I’m definitely throwing this Creme Brulee from Izaka-ya in the nomination bucket for a Golden Cherry! 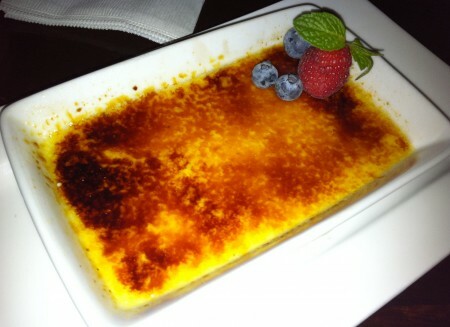 I mean, we all knew that Isaka-ya on 3rd street had some of the best sushi in town, but who knew they also had the most buttery, flavorful, sweet and delicious creme brulee too!? Normally, Japanese restaurants totally miss the boat on their dessert menus. I mean, a side of peeled orange? Sorry, doesn’t cut it for me you traditional Japanese restaurants you! While the Creme Brule was divine, the Fried Banana dessert left little to be desired. I’ll post that pic tomorrow. For more info on Izaka-ya on 3rds Street, click here. Really, I love nothing more than my Ladies Lunches where my favorite girls and I catch up for hours on end, enjoying a string of desserts to make it last! Our most recent gathering was at Monsier Marcel, the charming French, outdoor bistro at the Farmer’s Market on 3rd and Fairfax. 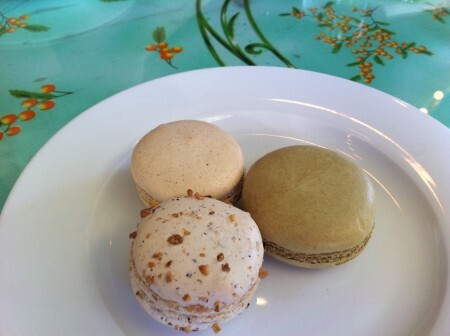 We loved the natural looking Macarons which had wonderful flavor and perfect consistency from cookie to filling. The Creme Brûlée was lovely the way that Creme Brûlée always is. Really, it’s hard to mess up Creme Brûlée. 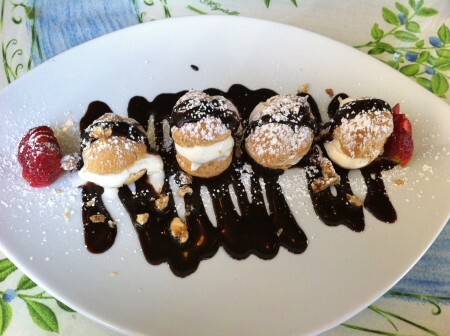 Where we lose cherries is over the disappointing Profiteroles. Profeteroles are a childhood favorite from overseas travels, so I have a preset standard for how they should taste. Unfortunately, restaurants in America never quite nail them the way Europeans do. The pastry puffs at Monsieur Marcel’s were too dry and crumbly, the ice cream too bland, and the chocolate sauce generic. Blah. Bla bla blah. 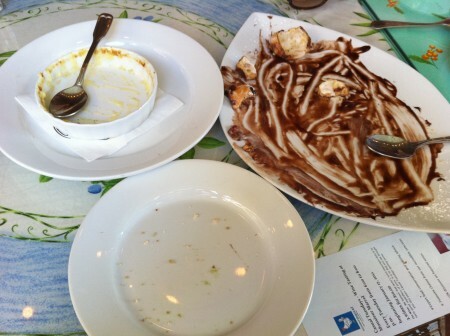 Ultimately, we did a good job cleaning our plates. For more information on Monsieur Marcel Gourmet Market and Restaurants, click here. This past weekend I had three sweet endings to an awesome night. It started with a shockingly affordable and delicious sushi dinner at Yatai on Sunset Blvd where we got this Creme Brûlée. The dish was quite shallow, which made for a high ratio of burnt sugar to custard. 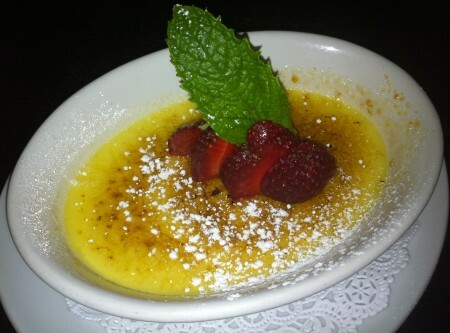 While everyone loves the crisp layer of browned sugar on top, I wanted a little more comforting custard to fill me up. Furthermore, the Creme Brûlée was served really warm, which I found off-putting. Then we ended up at a friend’s birthday, which had an Old Fashioned Chocolate Cake made by Sweet Lady Jane. 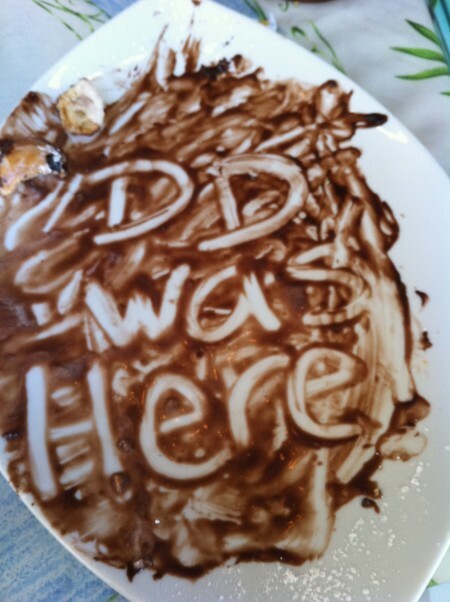 You may recall from this post here that I am not a fan of their cupcakes or dismissive behavior. Their cakes, however, have consistently scored better than average with a 3- cherry rating. 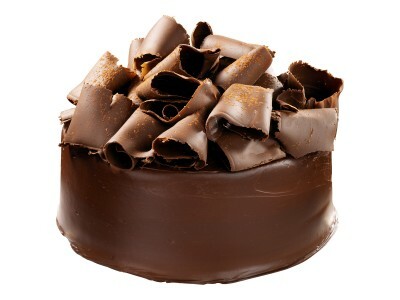 While I enjoyed the French chocolate buttercream and Belgian chocolate ganache, the overall cake lacked an addictive umph that makes one go back for more. 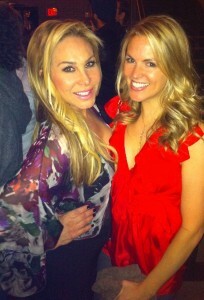 Finally, and most thrilling yet, I got to meet Adrienne Maloof at the birthday party!!! If you watch the Real Housewives of Beverly Hills, you know that despite her glitzy Vegas gear, Adrienne is the cool voice-of-reason who steers clear of drama, and has an endearing relationship with her husband, Paul. You guys, I am telling you- in real life she is ADORABLE. I mean, SO sweet, petite, and cute. Not to sound sycophantic here, but she kinda glows. And check her out striking that pose. I need to take notes! Three Cherries for the desserts and Five for Adrienne Maloof! For more info on Yatai, click here. For more info on Sweet Lady Jane, click here. For more info on Adrienne Maloof, click here!